Fringues célèbre ses 20 ans ! Fringues & Cie, a YWCA Montreal employability program, and Fringues thrift-boutique, its workplace intergration enterprise, are celebrating their 20th anniversary. Fringues & Cie was created in 1998 with an initial grant from the Fonds de lutte contre la pauvreté par la réinsertion au travail. The program and the boutique were officially inaugurated on August 24, 1998, in the company of Ms. Louise Harel, following a wage subsidy grant from Emploi-Québec. generated $1,000,000 in income that is directly reinvested in the program! Great finds at incomparable prices : Welcome to Fringues! Fringues is the ideal spot for women eager to make some great finds downtown at an affordable price. 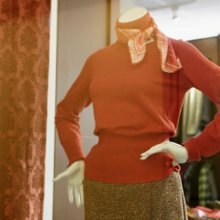 Whether it’s for work or everyday wear, the thrift boutique stocks a wide choice of new and second-hand clothing. The boutique is located at 1165 Crescent Street, mere steps away from the bustle of St. Catherine Street. Tops, pants, dresses, coats, shoes, accessories — everything you need at prices that can’t be beat! There is even a “$1” section for those who love to dig for that rare gem. Brand-name new and Montreal designer clothing can often be found in the store, all at an affordable price. Judith & Charles, Reitmans, Tristan , les Effrontés, Le Château and many more, regularly donate clothing to Fringues thrift boutique. Fringues distinguishes itself from other thrift stores by its meticulous marketing and choice of carefully selected and cleaned merchandise, which is systematically ironed and mended as needed by participants in the Fringues & Cie program. Fringues regularly renews its merchandise according to seasons, trends and its special special sales events. Follow us on our Facebook page so you won’t miss our sales! 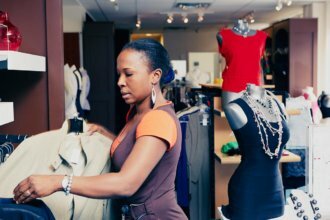 Fringues & Cie is an employability program provided by the YWCA Montreal and the thrift boutique serves as a work placement for program participants. All the boutique’s sale consultants are Fringues & Cie participants. This program gives women who have difficulty integrating the job market a chance to acquire their first significant job experience and receive training in sales and customer services. All profits generated by sales at the boutique are reinvested in the Fringues & Cie employability program. So, buying at the thrift boutique is a great way to support the mission of YWCA Montreal. Fringues is a job integration enterprise created in 1998 by the YWCA Montreal. The boutique is a member of the Collectif d’entreprises d’insertion du Québec. Monday to Wednesday: 10 a.m. – 6 p.m.
Thursday & Friday: Noon – 8 p.m.
- You know you’re getting quality second-hand clothing. - Clothes that have been cleaned, ironed, and, if necessary, mended, at prices that are simply unbeatable. - A wide choice of clothing for all occasions. Fringues also has a large stock of new brand name clothing, also at ridiculously low prices. - You’re choosing to consume responsibly by extending the life cycle of clothes that are still in excellent condition. - You are encouraging women's employability, because all profits are reinvested in the Fringues & Cie employability program. What is the source of donations? Clothing donations are mostly made by businesses and private individuals. Business: Want to organize a company drive? We can provide you with everything you need. Call us at 514 866-9941, extension 402. Individual: Drop off your donations anytime at 1355, boul. René Lévesque Ouest, Montréal (Québec), H3G 1T3. Is the clothing all new or second-hand? Clothing sold at Fringues may be new or used. Second-hand clothing is always cleaned, ironed and, if necessary, mended. Can be items be exchanged or reimbursed? Can I reserve an item in the store? Yes, you can have one or more items set aside for 48 hours. No deposit necessary. We do not buy clothes. The store depends exclusively on donated items. How do I get to Fringues? We are located at 1165 Crescent Street near René-Lévesque Boulevard. The closest Metro stations are Lucien l’Allier (orange line) and Guy Concordia (green line).